Well, we decided we would go back to Nautical Nellies for some more great food. The menu is so extensive that it took us quite a while to choose what we wanted. Linda chose a tasting canoe. It was an appetizer and she could not eat it all. It contained crispy calamari with citrus mirin sauce • spicy beans • scallops & macadamia nuts with sweet pepper chutney • one of their famous crab cake & cocktail prawns. 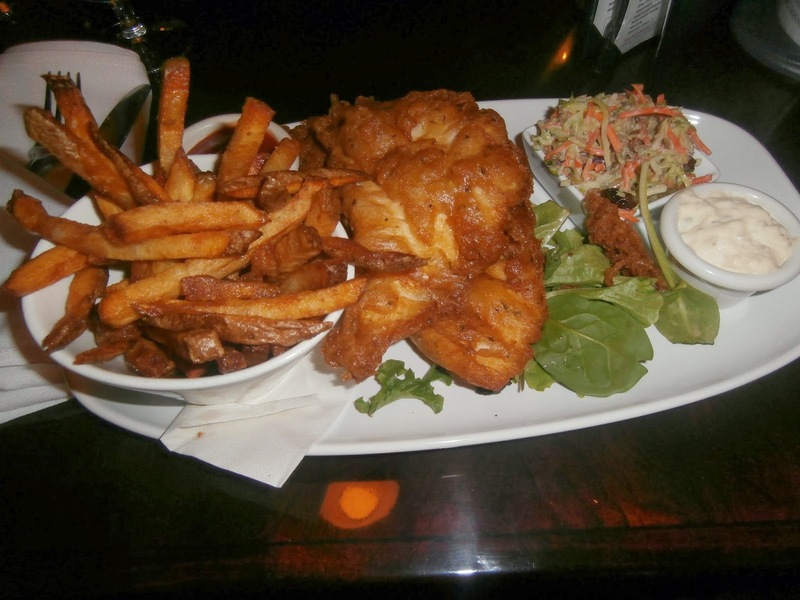 Ron started with probably the best Caesar salad in Victoria and then Fish & Chips with Halibut. Nellies makes the best french fries in Victoria - so tasty. No wonder Linda could not eat her meal - she got into Ron's fries! Everything we eat at Nautical Nellies is so tasty. If you have not tried NN or if you have not been back for a while, you are missing one of the very best restaurants in Victoria. Great service, excellent food and great ambiance. See you back at Nellies.